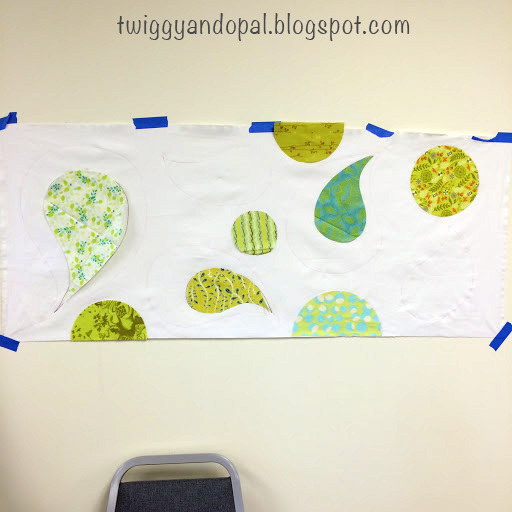 Twiggy and Opal: Two Workshops :: Long Days! Exhausting, but worth it! 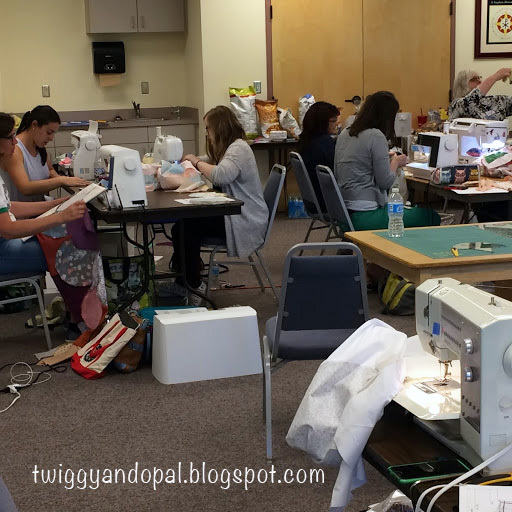 Two workshops and a trunk show in two days. It doesn't sound like much. But when one of those days is 9-5, nearly all sewing and something as of late I haven't done...its very tiring! I will start off by saying that I've never taken a workshop/class...ever. And, I wasn't going to miss out on this chance to take two. I took full advantage of the opportunity! 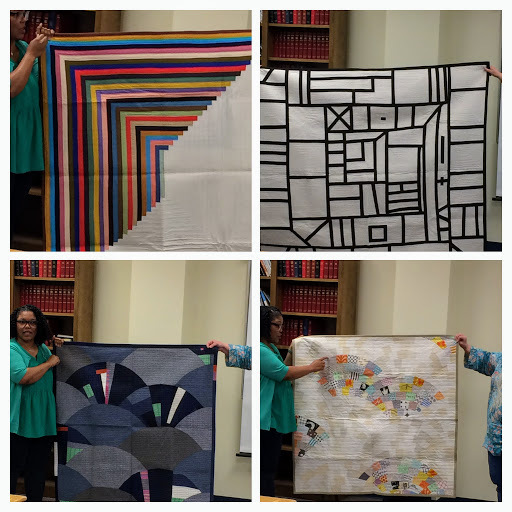 We had full classes, amazing company, lots of snacks and the chance to meet quilters from not just Nashville, but Memphis, Chattanooga and Knoxville! Meet Latifah, formerly known as 'The Quilt Engineer'. The lady behind the Glam Clam Quilts and templates. I've admired her for years and years. I believe my daughter steered me in her direction a long, long time ago! I was impressed with her warmth, humor, skills along with her her endless patience throughout the classes. She was just as I had hoped she would be and more. If you ever get the chance to meet her or take her workshops, you won't be disappointed! This post will mostly be about 'eye candy' in the form of Latifah Saarif and her quilts. They are worthy of a post all their own! Plus, I haven't finished my two projects and want to do so before sharing a lot about them. Our first workshop was all about Bias Tape. We got to pick a small project, sketch ideas and and attempt to execute them. This was a three hour class that flew by! I should have paid better attention to how to finish up ends in a pretty way...but I was to fixated on my table runner idea! My idea was paisley and circles. You can see I didn't get very far with the bias tape part of the class! The good news is I just need to quilt the runner and I can share it! 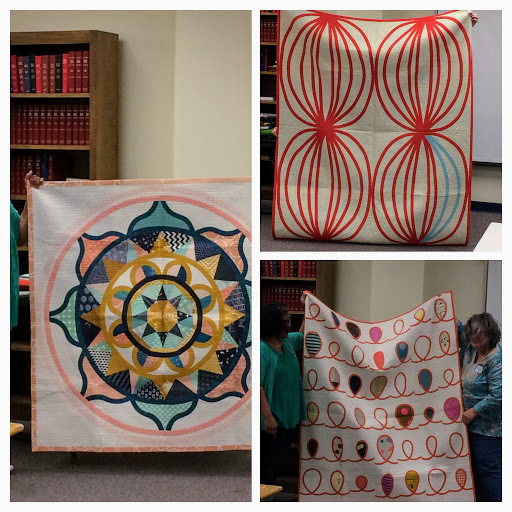 Aren't these quilts gorgeous?! These three are all Bias Tape quilts. The medallion is amazing! The next day was our full Glam Clam Day! It was an amazing day! I'm so glad I decided to take this class! Take a look at these Clams! The bottom left is the only 8" quilt out of these four. I'm loving the 12", even though the 6" clam caught my eye big time! For all you Glam Clam lovers...Latifah has a new design/templates coming out! Check out the upper left and lower right quilts...curious now?! We all got set up pretty quickly at our tables. Irons were heating...more snacks...fabric flying everywhere! Latifah demonstrated how to cut the side pieces. I over achieved and had mine cut before hand. You would think that should have allowed me to make more progress on my quilt, but it didn't! Check out her dress! It's from her fabric line 'Graphic'! Believe it or not, someone actually finished their quilt top! I know! They used the 12" template, which I thought was huge when I first saw it. Ummm...I should have gone with the 12"! Piecing together the clams is not a quick process. It was super awkward to me. The alignment of each clam confused me more times than I care to admit. That being said, don't shy away from it! If we don't push, we don't learn. This seriously pushed me! I completed the top row and six rows of clams! Like I said, it isn't fast! Once you get the hang of it, it does go a little faster. My clams are 8" and I'm doing a rather large (IMO) throw quilt. I am determined, dead set, serious as a heart attack going to finish this quilt! I'm afraid if I don't keep working on it I'll forget how to do it! And that would be tragic! Here's a few more Latifah originals! Gorgeous...amazing...inspiring! Notice the bindings on many of these quilts. It's a one inch binding that Latifah does on many of her quilts. Take her class...she shows you how she does it!! I will be giving it a whirl on my Clam quilt! Thank you Debbie @ A Quilter's Table for telling me to ask about the 'demo' of the binding! Let's just say this was a two day extravaganza for me!! It most likely won't happen again anytime soon! It was a blast! 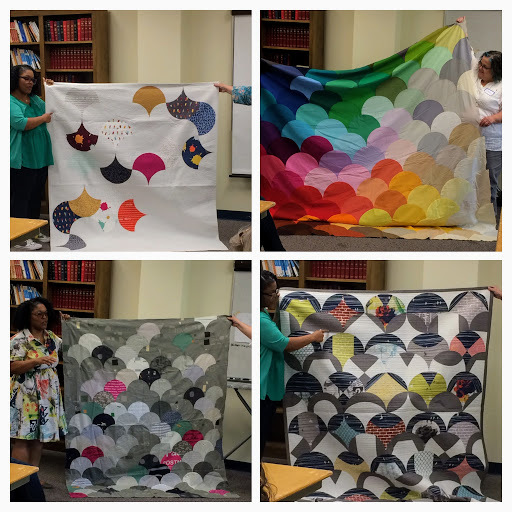 Even though The Glam Clam quilt was never on my radar…I couldn’t not take the class! I’m thrilled that I did because I learned so much! You can teach this old dog new tricks! Sounds like you had great fun. I like the look of paisley and circles, it has the openness and freshness I associate with much of your work. It's great to learn something new, and no matter how much we have done in the past with quilting there is always something new to learn. That's one reason I love it so much. I think thats a universal, across the board consensus on quilting! Learning something new and the evolution of our journey! The more time that passes we tend to change our style or aesthetics and with that we have to learn our next phase! I sound so serious! I can’t wait to quilt the runner…hopefully today! 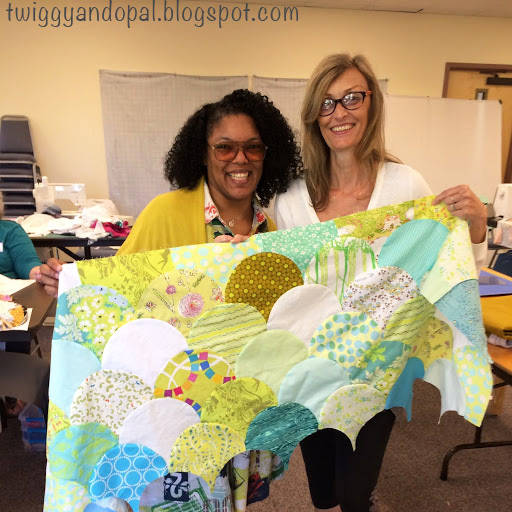 I never cared about making a clamshell quilt either - until I had the chance to do it with Latifah! Yours is looking SO good! 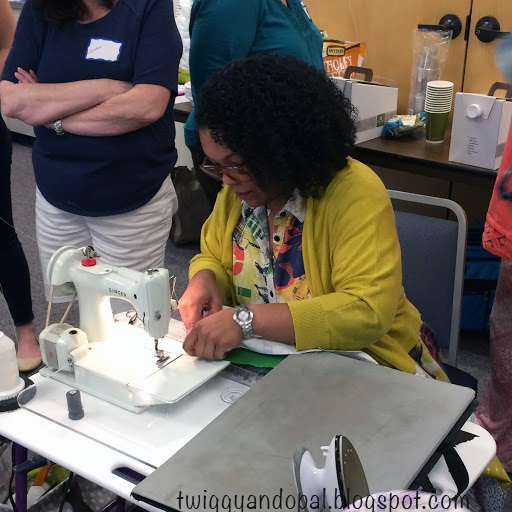 Other than my very first how to quilt class, I have never taken any classes either! It looks like you all had a blast!! Oh wow! I would have loved both of those classes. So fantastic! lucky girls!!! These classes seem fantastic! They were really wonderful classes. Latifah was amazing and learning from her is a dream come true! I'm glad you had a great time. I enjoy taking classes/workshops. 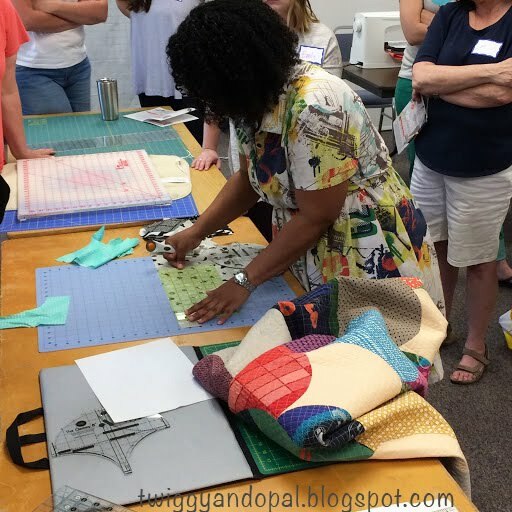 It's a great opportunity to socialize with other quilters, and I always learn something new. Sounds like you had lots of fun, I love the colors you chose for both the runner and the clams. Sounds like a lot of fun. Nashville is not too far away -- maybe I need to start looking for workshops there. What progress! Looks like ya'll had a blast! This looks like SUCH a great time!!!! Ack it's so fun to see, and I'm loving your makes so far! Enjoy! I love taking classes on new techniques. I look forward to seeing your runner. I haven't played with bias tape in years. Thanks for sharing with TGIFF! Looks like you had a real happy day! Love how your 8" clams are looking, great colour combo! It looks like you had a great time ! You made a lot of progress on your projects and I'm looking forward to seeing them finished. Oh, I love that new (up left) design. If I weren't so afraid of the clamshells... 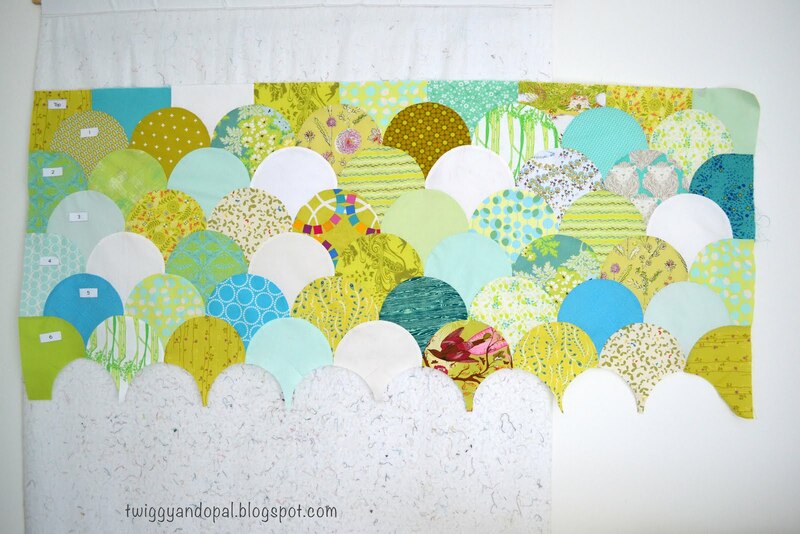 Your quilt looks fun, keep on going!